September 1928. 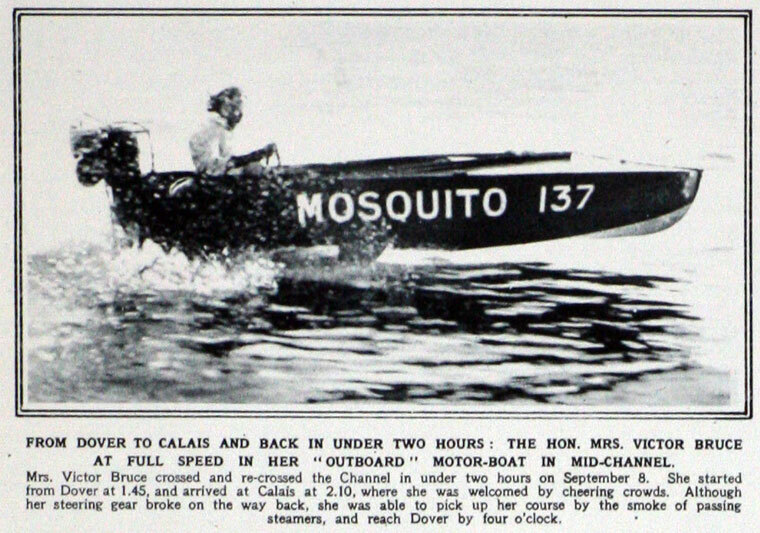 Record of two hours for Dover-Calais-Dover. Mrs. Victor (Mildred Mary) Bruce (10 November 1895 – 21 May 1990) was a British racing motorist, speedboat racer, aviatrix and businesswoman. Born Mildred Mary Petre in Chelmsford, Essex, England in 1895, the daughter of Lawrence Petre of Coptfold Hall. She showed an early fascination for speed and danger, beginning her road racing career on her brother’s motorbike at age 15, travelling along the country lanes with her collie dog in the sidecar. She is said to be the first woman ever arrested for speeding. She soon graduated to automobiles, and moved her racing from country lanes to tracks and regulated courses. She married the Honourable Victor Austin Bruce in 1926. They divorced in 1941. She was a regular competitor in European road races, and at tracks in England. In 1927 she won the Coupe des Dames, in the Monte Carlo Rally, finishing sixth overall. Later that year she and her husband, assisted by J. A. Joyce, set a 10-day endurance record at Montlhéry, near Paris, driving an AC Six. They drove another car 250 miles beyond the Arctic Circle, farther north than anyone had previously driven. In 1929 she drove a 4.5 litre Bentley at Montlhéry for 24 hours, to capture the world record for single-handed driving, averaging over 89 mph, a mark which has never been surpassed by a woman. In 1930 she decided to fly alone around the world. She bought a Blackburn ‘Bluebird,’ took flying lessons with Norman Blackburn, and set out after only 40 hours of flying experience. She was the first person to fly from England to Japan, the first to fly the Yellow Sea, and the first woman to fly around the world alone (crossing the oceans by ship). It was a five-month journey marked by a crash-landing beside the Persian Gulf, a near-abduction by brigands, a forced landing in a southeast Asian jungle during the monsoon. Upon her return in triumph she resumed auto-racing, joined a flying circus, flew helicopters, and won many horse show ribbons. She helped pioneer mid-air refueling in Britain and was a major force in pre-war commercial aviation, establishing several freight and passenger airlines. Her factory rebuilt damaged RAF planes during World War II, and when peace returned she continued her enterprising ways with a variety of enterprises which made her a millionaire. She test-drove a Ford Ghia Capri 110 mph at age 79. At age 81 she "looped the loop" in a 2-seater De Havilland Chipmunk, after a brief refresher course in flying. Bruce died in 1990 at age 94. This page was last edited on 12 September 2018, at 07:52.